The Mythmakers, the unexpected friendship of two wildly different men. Scott of the Antarctic and J.M. Barrie, the author of Peter Pan, were towering figures in their day, but Â even today few know that they were also close friends. New research reveals what drew these two together, why they were fascinated by each other, what dreams and sorrows they shared, why each longed for the life of the other, and what drove them apart as Scott left for his final expedition. Barrie’s family were weavers in the quiet Scottish town of Kirriemuir. His mother was an avid reader and her stories were the source of his early fame. He used to wander in the surrounding lonely glens and it was at his suggestion that Scott rented a cottage in Glen Prose owned by the man who published them both, Â to plan his last expedition to the Pole.. The Scotts were aÂ Â border clan. The fierce blood of the reivers , cattle thieves, ran in his veins. Capt Scott was a lover of literature and an intellectual like Barrie . His earliest ancestor in the 12th century was Michael Scott, ‘the wizard,’ a linguist and philosopher who maintained the first library in Scotland and who wove magic all over Europe. The two men were the biggest celebrities of their day and met escaping the idle chatter of a high society party. The inspiration for the play came after Farewell Miss Julie Logan, another play we had done at the Edinburgh Festival. The owner of the big house in the glen asked us to perform the play in his home. Over a wee drama of whiskey by aÂ wood burning stove his wife suddenly said, “Did you know Scott and Barrie were great Friends? Could you write about their friendship?” A lot of research followed. We finally presented the play with great trepidation in Mendocino, Northern California, with Carter Sears and David Woolis. It received an excited response. 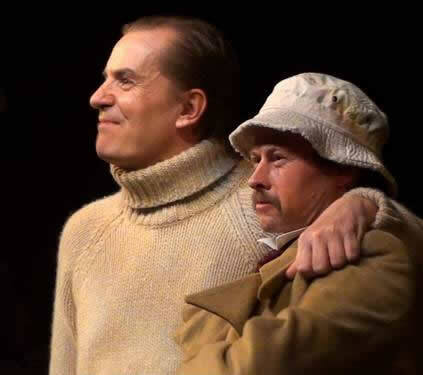 The Scott Polar Research Institute in Cambridge followedÂ withÂ a performance by Paul Antony-Barber and Lewis Rae, as the culmination of a celebration for the descendants of Scott’s last expedition. Then again in North Berwick, Scotland, with Kern Falconer. To celebrate Scott’s centenary it was performed in London’s West End. It was then chosen for New York Fringe Festival, and it played with the same cast on the Lower East Side in 2014. There is now a radio production by the same authors. The play (like I am certain Barrie and Scott themselves) is extremely verbal and intelligent.